I am having some issues about printing archives in Windows 10. 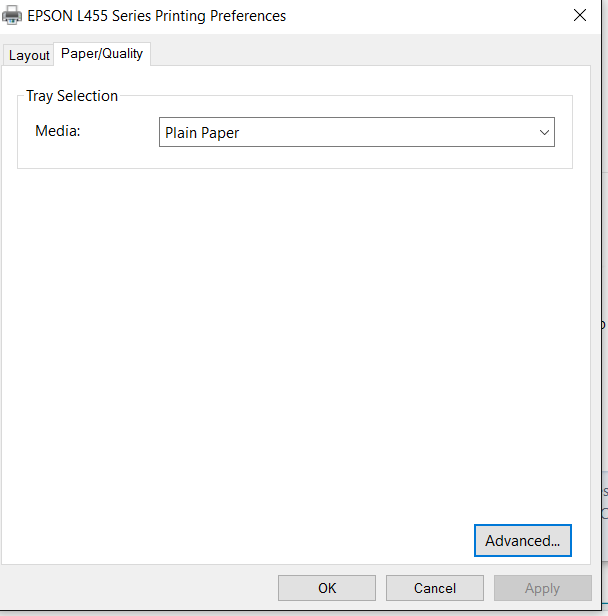 My printer, an Epson L455, would toggle between B/W and color printing according to my preferences in Windows 7. Nonetheless, when I bought a computer with Windows 10 and plugged the printer in, it would then print archives only in color. the question has been asked 2 years ago and its been necroed ??? its been answered correctly as well. Why modify it 2 years later ? just use the printer drivers instead of the Windows one. The problem with Windows printer drivers is not because they are bad but most of the time which depends on your make of the printer, they are just meant to work. If you want more "advanced" features, you have to use the one from your manufacturer. In this case, visit the epson website and search for drivers for the Epson L455 and install the drivers for your correct operating system. Not the answer you're looking for? Browse other questions tagged windows-7 windows windows-10 printing epson-workforce or ask your own question.